Our sister company in the Group “Find UK Property” helps overseas buyers find good low cost investment property in the UK. 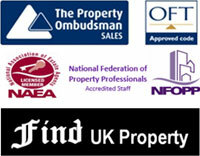 We are fully accredited and licensed members of the Association of Estate Agents and members of the Property Ombudsman Service. Our deal with Currencies Direct enables you to get the Best Exchange Rate for conversion to AED or any currency. If you speak to anyone simply mention 'Openshore Property' or code A03006 to get your special conversion rate. Simply click the banner below. To get the Map, simply enquire about any of the properties (click any "GET INSTANT E-BROCHURE" link). These Dubai properties are already rented out and managed by us. As part of the package, rent is guaranteed for 2 years. The rent from the Dubai property is used to pay for part of the property – so you end up paying less over 2 to 3 years of the payment plan. This service from Openshore from just £99, allows you to purchase ANY Dubai Property for sale in Dubai from ANY Agent or ANY Seller in a "secure" manner with research, second opinions, practical help within Dubai, and independent advice from us. The end result is that you end up getting a more suitable Dubai property for a lower price with complete Peace of Mind. You are not limited and can buy any Dubai property for sale from any agent or reseller. We help you with all aspects of the buying process. The payment (from just £99) is only paid if you buy property in Dubai. Many customers who have purchased property in Dubai want to put their Dubai property for sale and sell it, without having to deal with property agents in Dubai or make visits to Dubai for the transfer processes. Openshore’s service allows them to put up their Dubai property for sale easily and sell their ready Dubai property at the market price in an easy and secure way. We are part of a large UK group of companies specializing in IT and Property Management. The Group owns the 26 acre business park (Time Technology Park) where we have our UK offices in Lancashire. In Dubai we manage Dubai properties on behalf of customers and run Dubai property portals and provide services to other estate agents. Openshore staff have been managing and selling properties in Dubai for over 8 years, with excellent long-term service. The financial crisis of 2008 saw Dubai property prices fall by a massive 60%. From 2010 to 2012 Dubai property prices in most areas became stable and started to rise significantly from the beginning of 2013. Prices are expected to continue increasing over the next few years. As so much Dubai property was cancelled after 2008, there will be a shortage of property in Dubai over the next 3 to 5 years. Thus now is the best time to buy a suitable property in Dubai. See the Openshore Dubai Property for sale Index over the past 8 years during which we have been selling property in Dubai. Do you get a Visa with Property Purchase? Are Mortgages Available for non-residents? What are the owner’s costs and service charges? Which location are best for investment? Buyers have the full process in Dubai for viewing the properties, help with transfer of title deeds at Dubai Lands department and management of the property after purchase – like any other Dubai property purchase. In addition to this, for investment properties purchased from us, buyers have a legal agreement under UK law that covers the Payment Plan schedule, Guaranteed Rent, and secure client account services giving them additional security. For the best buy investment properties, we control all aspects of the purchase process directly and are fully accountable for it. We acquire suitable properties, rent them out and then sell them to investors in a secure manner; and continue to manage them on their behalf. When buyers purchase an investment property directly from us, it will already be rented out so that they start getting the rental income immediately. We will ensure that property title is transferred to the buyer at Dubai Land department and ownership documents are given to the buyer as part of our service. For "own use" properties, we can offer advice and guidance and refer to local companies specializing and best suited to deal with the type of property the buyer may be looking for. Here are some examples that show the type of customer (from different countries) currently buying investment property in Dubai and the processes they have followed. Each case study is written by the consultant who dealt with the buyer. Names have been changed but these are actual customers who have purchased. Andy is a UK national living in London in the UK. He had visited Dubai several times in the past and his friends purchased properties there many years ago. He contacted us for information on investment property in Dubai as he was planning to visit Dubai the following month with his wife and wanted to consider a purchase as he had around £60,000 of savings that were not doing anything. We provided him with information on the Studio and 1-bed properties for investment by email and also spoke with him regarding his requirements. He initially wanted to consider a 1-bed apartment but his budget was not large enough. He eventually decided to explore purchase of a Studio on plan B whereby 25% of the purchase price could be paid out of rental income. We told him that the company can, if required, upgrade his Studio to a 1-bed in the future. He would need to pay the difference in price that was prevalent at the time of the switch and any purchase fees and we would take the Studio back and give him a 1-bed. He wanted to consider things in detail and provided us with his passport copy and ID information to enable us to send him draft purchase contracts and the full procedure for a Studio purchase on plan B. He also wanted to visit us at our offices in Lancashire - UK and we arranged this. He travelled from London Euston to Preston and was collected from the railway station by one of our staff. He met with senior staff and saw our Group HQ building. He provided us with his Dubai visit dates, hotel and contact number in Dubai. We he went to Dubai, we arranged for him to meet our Dubai staff who showed him the Studio properties which he was considering. These were already rented out. After his Dubai visit he contacted us with the decision to proceed. He signed the agreement and made the first 10% payment into the client account with plan B (to make a larger 65% payment within 30 days, and the remaining 25% to be collected from rent). We credited him £100 towards travel costs for visiting our UK office. As he was now back in the UK after his Dubai visit, we arranged for the POA documents to be prepared for him and sent these to him for him to sign in-front of a solicitor in London. These were returned to us and we processed these via the UAE embassy and sent them to Dubai. This enabled our staff to represent Andy as the buyer to obtain NOC documents and to transfer the title deeds of the allocated Studio apartment at the Dubai Land Department from us to him. The title deeds were later brought by our staff from Dubai and eventually sent to him by special delivery. Andy gets rental income statements every 3 months and after his property is fully paid for, rent will be paid into his own bank account. Next time he visits Dubai, he plans to open a bank account there and we will deposit his net rental into that Dubai account. His property management is free for the first year and he is happy for us to continue to manage his property for future years. The cost of this is 10% of the rental income. We expect his rental income and property value to continue to increase. Samuel is a Nigerian businessman who lives in Abuja, Nigeria but does do a lot of travelling both to UK and Dubai. In the past (2007) he had purchased a premium off-plan serviced apartment property in Dubai direct from the developer who had an office in Nigeria and had provided a free trip to Dubai. He regrets this now as he feels he was "hard sold" this apartment by aggressive sales staff whilst he was on the free Dubai trip. He feels it was overpriced, severely delayed, is not delivering the promised investment returns, and is going to be hard to re-sell in the open market. Nevertheless, he liked our "ready" low cost apartments that were already rented out and came with guaranteed rent. He felt that these were likely to grow well in value in the future and was happy with the 8% rental yield. He had learnt about us from one of his relatives who had purchased a 1-bed apartment from Openshore about 6 months previously. After discussions of his requirements, he provided us with his wife's ID information (passport and address ID) as he wanted the properties to be in her name. We sent them the draft agreements for both a 1-bed apartment and a Studio apartment. He wanted to purchase both apartments and make full payment to obtain the 2% full payment discount. We agreed with him that they should purchase the Studio first and once satisfied with the process, proceed with the purchase of the 1-bed apartment. We arranged viewing for him in Dubai - he and his wife were in Dubai for 1 day only as they were just travelling through Dubai. We also prepared his wife's POA documents so that these could be done in Dubai at the same time. This would save her another trip to Dubai just to sign the POA documents. We arranged for them to go straight from the airport to the Notary office at 8:30am where they were met by one of our staff with his wife's POA documents. These were processed and handed to them. They were then shown the studio and 1-bed properties. After the visit, they decided to purchase both properties and also signed the 1-bed agreement (to avoid any price increase that was possible on the 1-bed property). Payments were made in USD to the client account and several payments had to be made as there was a daily limit of USD 10,000 for transfers from his account in Nigeria. Both properties were transferred to his wife's name via the POA documents and they asked us to keep the original title deeds in our Dubai office and not to courier these to Nigeria. He collected these on a subsequent visit a few months later. Both properties are managed by us and they are given regular updates and net rental income is paid into their UK bank account (they do not have a Dubai bank account and did not want income paid into their Nigeria bank account). Amir is a UK national and is originally from Pakistan. He has been working in the oil industry in Dhahran, in Saudi Arabia for many year. He has both Pakistani and UK nationality. One of his friends in the UK had purchased a studio property via Openshore and he contacted us. We sent him information on both Studio and 1-bed investment properties. He decided to proceed with the purchase of the 1-bed even without a viewing in Dubai as he was simply too busy to travel to Dubai and did not want to delay the purchase. He spoke with his friend who had visited us both at the UK office and in Dubai and had seen his own property in Dubai. We obtained his ID information and passport copy, and after his agreement was signed, we allocated a 1-bed apartment to him. He made payments for his property into our Dubai client account. About 3 months later he visited the UK and we were able to get the POA documents done in the UK and we processed these and got them stamped at the UAE embassy. This enabled us to transfer his apartment to his name at Dubai Land Department. Amir purchased his property on plan B and paid 75% of the property price. The rest is being collected from the rental income. Once his property is fully paid for, his net rental income will be paid into his bank account in Saudi Arabia. He is considering another 1-bed apartment purchase even though the price now is higher than his previous purchase. 4. Pradish (Indian in USA) - purchased TWO 1-bed apartments. Pradish is originally from India but now lives and works with an IT company in Buffalo in USA. He was looking for investment property in Dubai which he could use himself for holidays. He contacted Openshore initially via email. We spoke with him and discussed his requirements in detail. Initially he had thought of buying a 2-bed apartment in the Marina near to Jumeirah Beech, but the pricing was very high and he was having second thoughts. The reason he was considering this was because it was a nice area to live in. We agreed that it would be a good area if he was looking to move to Dubai and use the property himself. However, he was only going to Dubai once every year for about 2 weeks. We advised him that it would NOT be practical for him to use his Marina property himself as rental agreements are for minimum of 12 months. Furthermore, he would need to furnish the property and connect the utilities under his own name each time. Leaving the property empty would not be advisable as there will be maintenance issues and the high service charges would still be payable. However, he was insistent on such a purchase and we referred to him to several local agents in Dubai that specialize in properties in the Marina. After about 1 months of further research he realized that a 2-bed apartment in the marina would be outside his budget and as he was unlikely to use it much. It would be better to consider lower cost purely investment property and leave that rented out all of the time. Thus, with a much lower budget (almost 50% lower) he decided to purchase TWO 1-bed apartments from Openshore and to view the properties when he went for his two week holiday to Dubai the following month. At his visit he saw the properties which were rented out and he also provided his POA to enable transfer to his name. He was also able to open a Dubai bank account. Since purchase, both of his apartments have increased in value and his rental income is paid into his Dubai bank account. Kamal is hospital doctor from Sudan who is working in Dublin - Ireland. His ultimate aim is to purchase a small villa in Dubai in 4 to 5 years and possibly re-locate to Dubai with his family. He is working very hard for long extended hours 6 days a week to save money towards this purpose. At present he does not have sufficient funds to buy a villa. So he was considering purchasing investment property to ensure his savings grow. He plans to purchase one investment property each year and then he will have 4 or 5 such properties - enough to resell and acquire a Dubai Villa if he decides to do this. If his plans change, he may keep the properties as future pension income. He contacted us because one of his friends in the UK recommended Openshore to him. After discussing his requirements and reviewing draft agreements, he decided to do a day visit to our UK offices. Initially he was considering properties along Sheikh Zayed Road - Jumeirah Lake Towers, Marina and Jumeirah Beach. However on looking at the net investment returns he agreed that lower cost properties were giving better returns with low service charges. He travelled from Dublin to Manchester Airport via Ryanair in the morning and we collected him form the airport. Initially he was very nervous about purchasing a property in Dubai without visiting (He could not visit in the near future but wanted to acquire a property before prices increased). During that visit he met with staff, asked many questions and eventually agreed to purchase a 1-bed apartment and was also taken to a solicitor to sign a POA document. After his visit he was dropped off at Manchester Airport and returned to Dublin. He was allocated a 1-bed apartment with guaranteed rent which started to be credited to him 4 weeks after his second payment. His property title deeds were transferred to him using his POA. He visited Dubai about 8 months after his purchase when he was travelling to Sudan and saw his property and tenant then for the first time. He intends to leave his properties to be managed by us and is considering another purchase.